Guest reviewer Mark Burnette is reviewing the new Wampa, and the new Hoth Luke! I'l have my own review of the Wampa over at Yakface sometime soon, but alas, I don't have the new Luke. It's all yours, Mark! Mark Burnette currently resides in Florence, KY (Florence Y’all!) just across the border from Cincinnati. Earlier this year, Mark finished that awful monstrosity called a dissertation, and he is currently searching for a nice college teaching job with an office big enough for his collection of Star Wars and Muppet figures. Mark is reviewing both Luke (Hoth Attack) and Wampa (Hoth Attack). Wampa is part of the newly named Ultra Figure collection, which currently includes C3-PO w/ Escape Pod and General Rieekan w/ Hoth Tactical Screen. Although Wampa and Luke are sold separately, they are clearly meant as a team. Luke enjoys hanging around in Wampa’s cave, and Wampa finds Luke to be quite a disarming guy. Okay, enough with the bad puns. On with the review. . . Overall, I like the look of the Star Wars Saga line. The blue and gold color combination works, and I particularly appreciate the use of the film name on the edge of the card, which makes it easier to spot a particular figure that may be several spaces back on the peg. I think, however, it is coming time for a change to mix things up. But that may just be me. Luke Skywalker (Hoth Attack) **** - The sculpting of this figure is really exceptional. The face actually looks like Mark Hamill!. Of all the Luke incarnations that have been released over the years, I would argue that this one captures Hamill’s features the best. When you compare the body sculpt on this release with the Hoth Luke that came packaged with the 1998 version of Wampa, you can immediately see how far Hasbro has improved in the creation of a realistically proportioned human figure. The sculpted folds in the fabric are effective without being overdone. Even the “stance” of the figure, with the chest ever so slightly puffed-out and shoulders slightly back, evokes Hamill’s physical performance of the character. Did you get the idea that I liked this figure? Wampa (Hoth Attack) ****- Hasbro has another winning sculpt in this second cousin to the Abominable Snowman. The sculpting of the fur is deep and realistic, with three separate layers in the torso area. The head is a separately sculpted piece, as are the detailed horns. The head and torso of the Wampa in the 1998 release was one sculpted piece, and it created a no-neck look that just didn’t cut it. The overall sculpt really captures the look of the Wampa from his (her?) appearance in the Special Edition of The Empire Strikes Back. Personally, I thought that the new footage of Wampa looked too much like a guy in a monster suit, but you can’t fault Hasbro for following the design of the character. 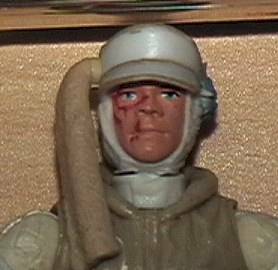 Luke Skywalker (Hoth Attack) *** 1/2 – Hasbro did a very good job with the paint on Luke. The color palette is subdued, but that is true to the source material. The scars on the face are very precise—no slop here. My only complaint is that the paint lines around the boots were a little sloppy. But the detail on the belt and his insignia is very clean. Wampa (Hoth Attack) *** 1/2- I also like the paint detailing on Wampa. The use of a brownish yellow through out the fur compliments the sculpting, which is what a good paint job on a figure should ideally achieve. The detail in the face is clean, with blood trickling down the sides of the mouth and on the chin. My one complaint is with the inside of the mouth—it is unpainted. It seems like this area should have received some sort of paint application. This color could have made the teeth pop out a little more clearly. It certainly does not ruin the figure, but it would be my one specific suggestion on how to improve the paint job. Luke Skywalker (Hoth Attack) *** - Although Luke could have more articulation, the amount provided works very well. I especially like the neck, which allows side-to-side and up-and-down movement. The arms are ball jointed, but they don’t stick out from the body nearly so obviously as some past ball jointed shoulders. There are also articulation points at the waist, the hips, and the “scarf” that hangs from Luke’s hat. It would have been great to have knees that also bended, but the articulation is especially chosen for the Hoth Attack sequence, and as such it is more than adequate. Wampa (Hoth Attack) ***1/2 - Wampa has articulation points at the neck, shoulders, the torso/waist, and hips. The torso/waist articulation on Wampa is really clever. By using separately sculpted layers of soft plastic fur, the figure can twist around with a wide range of mobility without disturbing the sculpting. This works because of the soft plastic, which explains that choice. My only complaint is that it takes a bit of time to get the figure balanced, and some poses can make it a little top heavy. But once you find that balance, I have not had any problems with shelf diving. Oh, and his arm comes off, and there has been some blood painted at the stump. Luke Skywalker (Hoth Attack) **** - Luke comes with three accessories- an ice base, googles, and a light sabre (four, if you count light sabre blade and detachable hilt separately.) The base is wonderfully detailed and cast in clear blue plastic with frosted areas, giving it a realistic ice appearance. 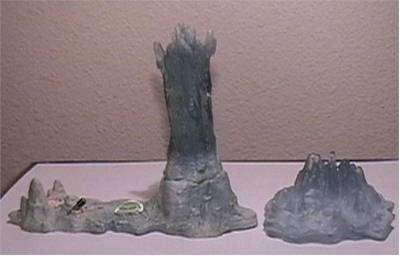 The base can be used for Luke when he stands upright, or it also attaches to the top of the ice pillar that comes with Wampa’s base, allowing Luke to hang from the ceiling. The goggles are nicely done, and the two-piece light sabre allows Luke to recreate the reach for the hilt as he hangs from the ceiling. Wampa (Hoth Attack) ***1/2 - Wampa comes with two accessories- a large detailed cave/base, and a bloody piece of Taun Taun meat. Both accessories are well sculpted and painted, without missing the small details like the bones of the past victims that lay on the floor of Wampa’s cave. The base even includes a hole for the hilt of the light sabre for Luke to grab with the power of the Force. Luke (Hoth Attack) **** - Luke can currently be found at Walmart (where I picked mine up) for the bargain price of $4.77. If you get him for a dollar or dollar fifty more, I would knock off a star or maybe half a star. Wampa (Hoth Attack)***1/2 - Depending on where you find Wampa, it will cost from $8.99 - $11.99. I got mine for $9.99, which is a very reasonable price. Because there is some price fluctuation, I averaged his value at ***1/2. If you get him for $8.99 - $9.99, then I think he is close to a four star value. At $11.99, he is a three star value perhaps. From the first photos I saw of these two, I have been anxiously awaiting their release, and I must say that the final product does not disappoint. The sculpting is top notch, and the articulation and paint is equally good. The only disappointment I can imagine with these two is finding just one and not the other in a store. These figures are designed to go together, and when combined they do an amazing job of recreating a memorable scene from The Empire Strikes Back. Although it would have made sense for Luke and Wampa to be sold as a set, in one way I’m glad that they weren’t. The pack-in figures Hasbro provides are often not sculpted/articulated at the same level as regular release figures (or they are repainted previous releases) and that might have meant a much less impressive Hoth Luke figure. 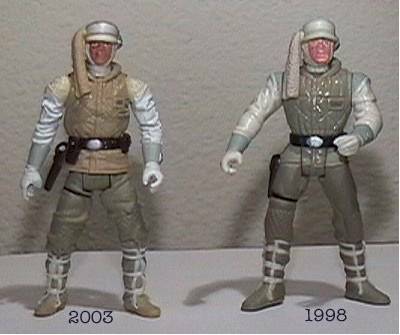 Figures from the collection of Mark Burnette.